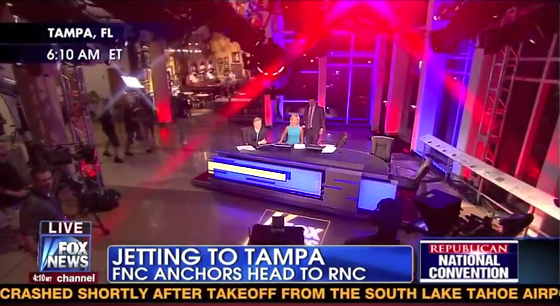 Johnny Dollar has posted two videos showing the Fox News HQ in Tampa for the Republican National Convention. Located in the Tampa Bay History Center, the Fox News set is in the buildings atrium which provides views of the area. The setup includes a large portable desk with backlit elements. The desk seats at least five people and has large windows behind it. Lights are used to accent the windows with red and blue colors. Off to the side is a bar with the “newsroom” nearby in a conference room.